Ouzo, early on, on Lake Hartwell. PENDLETON South Carolina—(Weekly Hubris)—February 2019—From the very beginning, from the moment we first saw Ouzo, I knew he was the one. Up until that day, and ever after Ouzo, I have failed (after a fashion) with dogs. My first dog, a wire-haired terrier brought home to me when I was five, bit me in the face, and was returned to his breeders. My second dog, Brandy, a golden mutt of too much tail and too short legs, I brought home from a Chicago pound in high school. But my family moved soon thereafter, and Brandy found a happier, more permanent berth with neighbors. 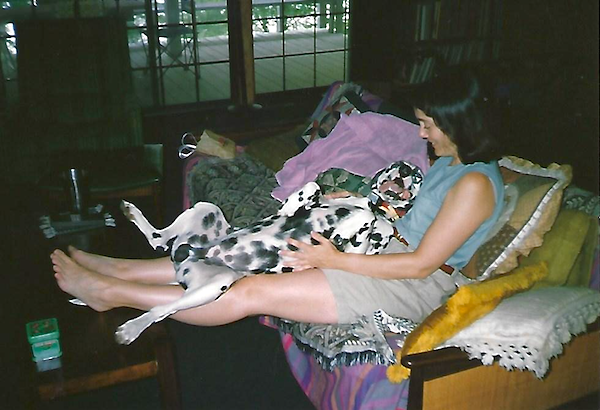 My third dog, a stray collie, I rescued in college: within weeks, Gulliver had died in my arms of internal parasites. My (briefly) fourth dog, Tatavla, far preferred the local butcher in Ano Mera, Mykonos to me, and I could not blame him. He ran away one last time, and I let him go. My fifth dog, Thor, a toy poodle, was the “gift” of a beau, and meant to tie my feet to his floor (after a fashion). Thor soon found a permanent home with my cousin Larry but, more importantly, with Larry’s towering Black Lab, Cleo, with whom he formed a canine marriage till death did them part. So, it was not until my late 40s, in South Carolina, that another dog came into my life, sat, and stayed; from the moment we met, Ouzo was not to be one of “my” dogs at all. In fact, Ouzo taught me that to apply possessive pronouns to dogs is a fool’s errand. Dogs belong to none of us. Even dogs described as “one-person dogs” belong to none of us. Dogs are a shared treasure, to be loved by as many beings as they will allow: but dogs belong, properly, to themselves, alone. Instead of coming into my world, with all its strictures, Ouzo pulled me across the divide into his, and there, we lived in bliss. Because I paid for Ouzo, I claimed naming rights and, though he had no “papers,” we knew he had a pedigree. 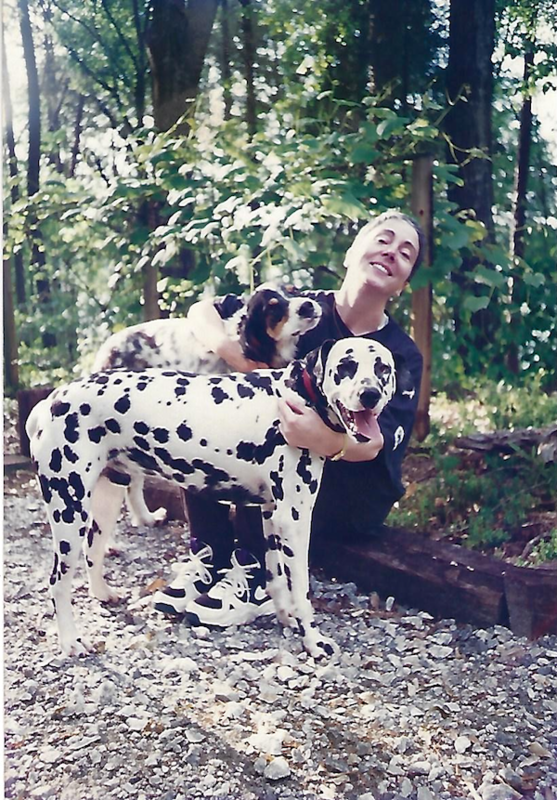 Ouzo was a pure-bred dalmatian, with all the havoc such breeding (such over-breeding) entails, and so I gave him a name with some history, some weight. Because he was both sweet and strong, he would be Barba Yiannis Tis Mytilinis, or “Uncle John of Lesbos”—the several-syllable moniker of my favorite Greek ouzo. With his respectable full name in place, though, he would always be known as Ouzo. My friend Walter, a master wood-worker and paramedic captain, and one of the two residents of my second home on Lake Hartwell, had only just survived, narrowly, being hit by a drunk driver. His hands pinned by his truck’s steering wheel, with gas pouring down upon him, he had been cut out of the wreckage by colleagues. It would be months before his hands would function again, and the nerve damage has proven permanent. Walter came to live at my lake house because, in the aftermath of my mother’s death, I had inherited the property, and it, among other of my mother’s buildings, needed renovation. In the basement lived my colleague in Clemson University’s English Department, Bosnian refugee Samir Busovaca. The puppy Ouzo entered a full house, and a house ready for a boisterous, adoring dog. Over the coming year, Samir and Walter had a place to live while renovations on the house were undertaken, and I had a small, if testosterone-freighted “pack” of friends. My mother had died, my English fiancé had taken off for Hong Kong; I had houses to fix up and sell, and students to teach. Samir, of Sarajevo, spoke widely in the area, educating American journalists about the war in his homeland, Walter undertook work, as his injured hands permitted, on my late mother’s properties, and I, nursing a twice-broken heart, kept a roof over several heads. What better way, I reasoned, to help Walter recover physically than to introduce, into this ready-made “pack,” a non-verbal being? What better way to bring comfort to a jilted bride, an injured craftsman, and a shell-shocked, Yugoslavian refugee . . . than a dog whose forebears hailed from the far Dalmatian Coast? Ouzo, the author, and the “friend” who tempted Ouzo into the road. The breeders, for whom their pure-bred dogs were a source of income, were local, working-class folk from Seneca. I saw an index card in a Clemson store window advertising puppies ready for sale and, knowing something about the breed, thought a dalmatian would be a good fit for Walter. When we arrived in the couple’s front yard, we could see the dogs, and hear them, around to the side, and went to look over the wire fence. The mother was old, spent, and heavy, making no effort to keep up with the members of this, her final litter. The father, a very young and beautiful dog, leapt and barked from a smaller enclosure. Ouzo was the runt of the litter, underweight and dark but, as well, the leader of his pack of pups. Three of the five were roaring around the back yard, a stick in all three mouths, and Ouzo would not give up till the stick was his alone. The puppies’ birth had been traumatic, we learned. Ouzo, born first, had been born badly, and his mother was later removed to the vet for the delivery of his siblings. Ouzo, pinned under his exhausted dam, was cold and hungry for hours, near death till the breeders realized one puppy had, indeed, emerged. He recovered, but he was notably smaller than the others. When, finally, we met, in the flesh, though, it was Ouzo who came up to us and leapt into our arms. it was Ouzo who rolled onto his back, asking for hands, any and all hands. We knew he represented a risk but, then, so did we. One of us would be paying all of Ouzo’s bills; the other would be his “owner,” ever after and alone, on paper. And Ouzo would live at the lake with not only Walter, but with Samir. I would give my heart away, on that first day, to a creature who would never be “mine”; never, certainly, be mine, alone. And, despite all my recent losses, I was somehow willing to accept that bargain, that slightly raw deal. Love, just damn it all, has its own ideas about how it will be, and what it will be. Ouzo, acquired to be “Walter’s dog,” instead became Walter’s dog and my dog and Samir’s dog, and, and, and . . . . Puppy and dog, he was love incarnate. He loved: therefore, he was. We took him home to the lake house, and Walter set about building him an enclosure, along with a solar-paneled dog house. The hands that caressed the puppy healed slowly, but healed. The property comprised five acres, so there was plenty of room for the three men of the house to stake out their territory. We all learned early that Ouzo would not be restrained by a so-called invisible fence. Before his pen and dog house were finished, Ouzo had followed another dog into the little-traveled road and been hit by a Clemson nursing student who, thank God, stopped and administered first aid. 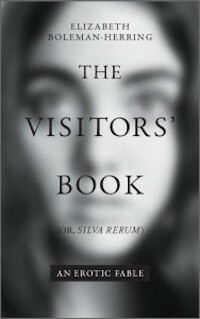 She called, weeping, to say that Ouzo was grievously injured; Walter—and this was in the days before we all had cell phones—was home, took the student’s call, and rushed down to lift Ouzo onto a wooden pallet and start an i.v. I came from Clemson to meet him and we went straight on to the University of Georgia Veterinary School, where surgeons took Ouzo, immediately, into surgery. It would be months before we knew which way things would go. Walter, I, and my friend, Emily Hipchen, who was teaching at UGa, took turns sitting with and holding Ouzo. His badly broken front leg had been bionically repaired; the bones secured with novel pins and plates. But his spine and hindquarters were also injured, and the doctors had created a little trolley so that he could walk and exercise. For a while, our little fighter seemed unwilling to fight for his life. He lay in our arms, almost extinguished, though he had been, from birth, a spirit of speed, light, and joy. At some point, though, Ouzo rallied. Walter and I appeared at the clinic one day and were alarmed not to find Ouzo in his “room.” When we asked, with great trepidation, where our dog was, we were told that he was “on grand rounds,” on his cart, visiting other wounded animals, with the doctors. Finally, we found him at the head of the conference table in the vets’ meeting room, eating a bowl of ice-cream and surrounded by his entire medical team. What I cannot convey to you, what I can never convey, is how Ouzo was with people. 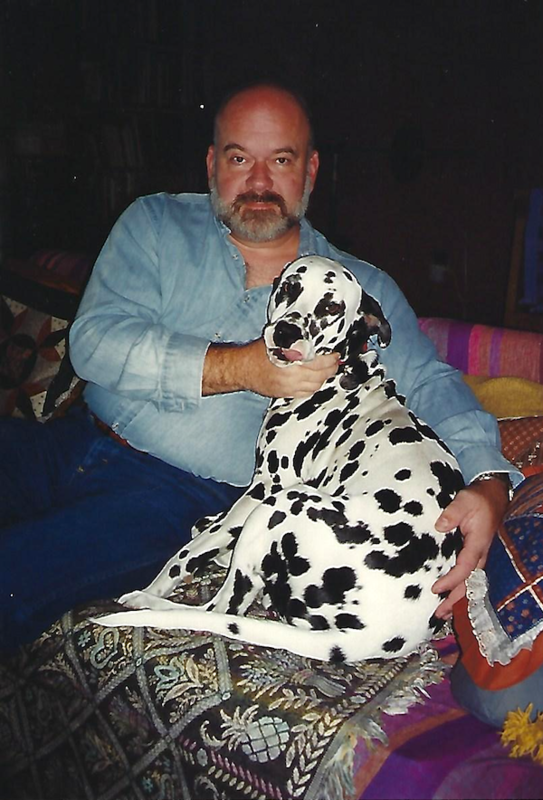 Dalmatians are not known for their clubbableness, but Ouzo sized people up and, if you were a loving person, he threw himself into and onto you. It is as though he wanted, always, to establish contact with as much of you as his skin, and yours, would permit; for as much of the day as you would allow. And for as much of the night. If I fell asleep on the sofa, he would lie, full-length, beside me. If there were not enough room, he would remain, nose-to-nose with me, unwilling to wake me, but breathing my breath, breathing back his, till I opened my eyes again. And he loved me, Walter, Samir . . . and his doctors, equally, and abundantly. When, at last, he was well enough to go home, his primary vet, a young woman, could not bear to be in the room to see him off. We learned later that she had transferred from the school when Ouzo was due to be released; gone on and out into private practice, grieving his loss. She had brought him back from the dead, spent every day with him at the clinic after he came out of surgery, and supervised his miraculous recovery—Ouzo would run and jump and play for the four years he was given on our planet because of this doctor. 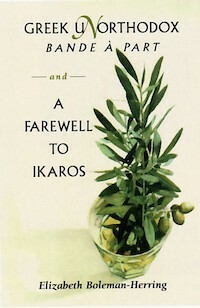 But to know Ouzo was to be smitten, and she chose not to say farewell in person. Ouzo, at the end of his rainbow. 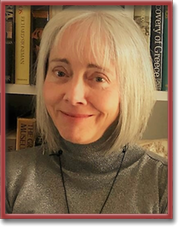 Of course, life being the unpredictable and fulsome thing it is, at 49, I met the human love of my life, and went off to the north to be with him. 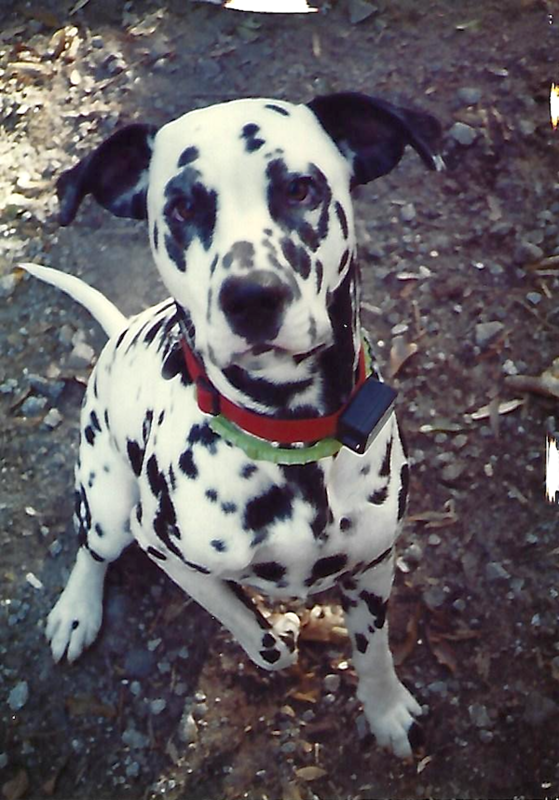 I knew, before I left, that Ouzo was suffering from kidney disease and, while I was on Corfu, writing a travel guide to the island, the dalmatian that belonged to all and none of us entered his final crisis. Walter had moved from the lake house to Salem, South Carolina, and Ouzo’s entire enclosure and dog house had been relocated there. Ouzo was, if anything, happier on Walter’s 20 acres than he had been on my five, though he found no dead fish there to roll in, one of his great pleasures. I was on a high floor at the Corfu Hilton when I took Walter’s call. In kidney failure, Ouzo had died in Walter’s arms, finally released from his suffering with the local vet attending. I thought my heart would break open then forever and spill out into the landscape. Looking down on one of the most beautiful scenes on this planet, the wild Corfiot coastline, I grieved noble Barba Yiannis Tis Mytilinis. Ouzo, overbred and doomed by that breeding to a short, if glorious life, was just four when he died. 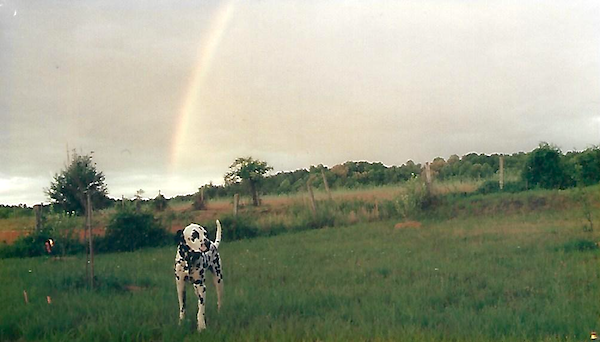 The last photographs taken of Ouzo show him in his element, in the high meadow behind Walter’s farm house. A rainbow hangs in the sky above him, and he is at the end of it. I am 67 now, it has been so, so many years since his death, but the tears persist. What I knew of love before Ouzo came into my life feels, in retrospect, so cramped and small and limiting. There was nothing of me and mine in Ouzo: there was only us, us, us! We! And love for all who love. Sweet and strong and true to us all, he healed wherever he went. And, after he went, I found I was allergic to dander, all of a sudden. Cats, dogs—it seems there will be no others, at least no intimately-held, furry others, again in my life. Perhaps I learned, from Ouzo, the great and lasting “Lesson of Dog,” and passed the course. Perhaps, now, my pack must be relatively hairless and love with less abandon than did Ouzo. Or perhaps, one day, the scratchy eyes and itchy skin will be, again, things of the past, and another litter’s runt will choose me as one of his or her companions. For however long the relationship lasts, I hope to be open to it. I love this piece so much. You NEED to be writing! I am also smitten by your poetry in Claire’s column. Another way into love, and your story is so very clear and true! I remember, years ago with the part coyote, part german shepherd who was part of our lives for about 12 years, how I always thought of her as a person first and a dog second. This was just natural, I didn’t do it on purpose. I love how specific Ouzo’s story is, nothing generic about the dog or the particular love that swirled around him. And you so gently allowed this all to emerge. And thanks to Mary Oliver for all that she has done for our beleaguered world! Thank you, Robin, Anita. And yes, this was a piece about specifics, about τὸ τί ἐστι. Forgive me if, in remembering Ouzo, I am thrown back to Aristotle, and to haecceity and quiddity: Haecceity being the “essence” of a thing, a synonym for quiddity or hypokeimenon. And, whereas haecceity refers to aspects of a thing that make it a particular thing, quiddity refers to the universal qualities of a thing, its “whatness,” or the aspects of a thing it may share with other things and by which it may form part of a genus of things. Ouzo was both all dog, all dogs; and a very, very specific “person.” (You hit the nail on its furry head, Anita.) My spirit remains “informed,” perhaps even enlightened, in the area through which he moved; my heart remains broken on the wild shore of dog. There IS no other dog for me: he took the arms I grew for him . . . with him. Lovely, in the way of forest paths and the smell of spring mornings. The taste of the air near the ocean. Pulses. Joy. Joy, undarkened by awareness of mortality – or, is that our arrogance? Do they, perhaps, know, and not care, having evolved PAST the limited corporeal understanding we have of life? Our Dash was a bodhisattva, and changed us both on elemental levels. This is grand, and I feel him. They are both generous and fearless in their manner of loving, and you convey that in a manner worthy of your subject, with both elegance and heat. I love this piece, Elizabeth. It has so much affection and verve. Clearly Ouzo is still alive in you. Well, that’s high praise, Don: as you know, you are one of my own favorite writers. It’s taken me decades to write about Ouzo: I nearly missed my deadline. And I cannot do the dog, any dog, justice. Cats, as well. Ahhhh, cats. But dogs have decided to teach us, and cats no longer bother, I think. Filakia, Palikari! Old friend of Sammy. He mentioned you and that I should contact you. He’s like that, you know, always connecting people. I’m perched in a cabin at 9000 feet on the side of a mountain in Colorado currently producing a strange bit of creative nonfiction after leaving Chicago recently. Missed Parker. It’s not long. Beginning of a memoir, and I’m not sure what to make of it.